How much would it be to make a Alice in Wonderland cake for 12 people? It depends on what size cake you get and what kind of decorations you want. Only the pastry team making your cake can tell you the exact cost. Use the contact info on the Cake Options By Location page for the resort or park where you want the cake. A 4-layer, single-tier fondant-covered cake will cost more than a 2-layer, single-tier buttercream-covered cake. You could probably get away with an 8-inch cake for 12 people—Disney is very generous in their estimates of how much cake people need. Wonderful!! Thanks so much for your help and for the good news!! Just as a follow-up, I did get to speak with my resort (PC) and she did advise me they thought it would be no problem! YAY for Disney; keep that magic coming!!! HOORAH! Hi! I’m fortunate enough to be going to WDW last wk Feb-1st wk Mar. I want to pls know if I can get a white cake with chocl icing?? Do you know if they will do this??? I want a 6″ reg. old cake. TIA! It depends on where you want to have the cake but shouldn’t be a problem at most places. Use the contact info on the Cake Options By Location page for the resort or park where you want the cake delivered, and the person who answers the phone will let you know if it’s an option. Carrie, if you have a Disney Wedding Cake, can you save the top layer for your honeymoon suite? Yes! It’s actually common practice with Disney’s Fairy Tale Weddings not to cut into the top layer. When they quote you the number of people the cake will feed, they don’t even count it. What is the best Resort to order a fancy cake from? I prefer the Contemporary and the places it serves (Magic Kingdom, Wilderness Lodge, Fort Wilderness) because they are easier to work with and their prices are lower. Hello I would like to know Where can I go to order a Cinderella castle cake what Disney location can I go to. Hi Luz! For the mini white chocolate castle on a cake, the only places you can definitely get them are the Grand Floridian and the Contemporary, but I feel like someone got one at either BoardWalk or Yacht & Beach Club recently, so if one of those works better, it doesn’t hurt to ask them. You’ll need to contact Disney Cruise Line at (800) 601-8455 to see if they can accommodate you. Hi, I’m trying to order a special cake for my son birthday we will be in June to celebrate his special day. If someone would contact me I’m regards to this matter. We are coming to Disney for our grand daughter’s 5th birthday. We are staying st the animated hotel and we would like to order her a Frozen cake. 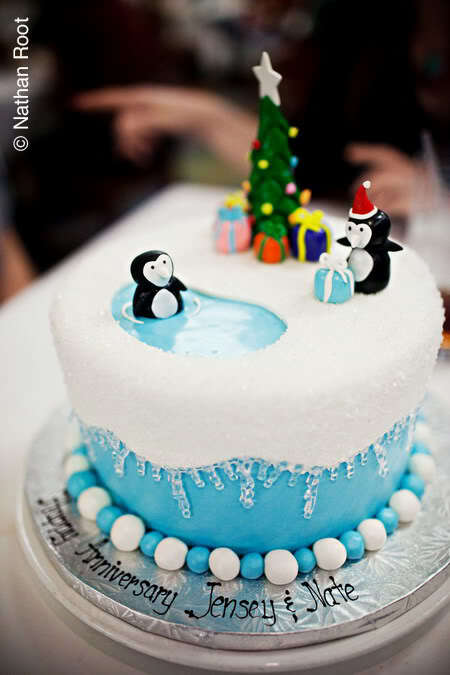 Is there anywhere we can order this cake? Coming to WDW in May & staying at the Port Orleans Riverside. Need to order a cake to celebrate 3 generations of birthday in May. Can I get a 1/4 sheet cake there or should I stick with the 10″. There will be 16 of us. You should be able to get a 1/4 or 1/2 sheet cake there. I got married at Disney this past May and will be going back for our anniversary this coming up May. I wanted to get a top tier replica made and delivered to my room at the Animal Kingdom Lodge. Who would I need to call to see if this is possible and how far out do you think I should call? Thanks so much. Ordering info for Animal Kingdom Lodge can be found here: https://disneytravelbabble.com/how-to/order-cake/by-location/#akl I’d call no more than about a month out and no less than 2 weeks out. Hi, I just wanted to share our quick B-day story with everyone. A few years ago when my son was 6 years old we surprised him with his Birthday party at Disney World and first thing early before the park even opened we had breakfast in Cinderellas Castle with all the characters and surprised him with his own Mickey Mouse cake that was delivered to our table, he was so happy while eating his Disney bday cake and opening his present with Cinderella, Snow White and Belle. I’ve been drooling over the thought of cake all day. I was wondering if you had any suggestions or tips about getting a small cake in the next week-ish. I am looking to celebrate a birthday, we would be at or picking up from the Contemporary, don’t need fancy decorations, about 3-4 people will eat it ideally (up to 5), and I am hoping to incorporate caramel or caramel chocolate mousse. Oh, and all for around $30-40. It’s rather hard to judge the scale of the mini-cake and mini-wedding cakes (are they even different). I think a 6 inch might work or even be too big. If I can’t figure something neat out then plan B is a chocolate glass slipper. That’s tricky… if you had 3 people, I’d say a mini-cake (one tier or two-tier) would be just enough. But with 5 people, you’re definitely going to want a 6-inch cake. A mini cake will probably set you back $35-$45, whereas a very VERY basic 6-inch cake is $25-$35. That would be with just standard buttercream, no fondant or decorations, but it sounds like that’s OK for you. There isn’t really a standard mini cake or mini wedding cake. People sometimes use the latter term to describe a 2-tier mini cake, but Disney doesn’t have a set design anywhere that they call “The Mini Wedding Cake.” Either way, the minis are about 4 or 5 inches across, and a 2-tier has a teeny second tier on top. Hope this helps! Thanks so much . Do you know if anyone has luck getting Disney to customize the filling flavor of the 6 inch to one of the wedding options (the recipient prefers buttercream to any fondant)? Or do you think we are just limited to the podium cake pre-set flavors? For the same price of a standard podium cake I can get an 8 inch back home from our favorite custom bakery, so I want to make sure it’s delicious. Would you suggest asking to pick it up from the Wave? I think if anyplace will let you do it, it’s the Contemporary. I’ve heard of them doing Wave pickups before, so it should be easy! We tried to order a cake when we celebrated our 25th wedding anniversary. It was nothing but a disaster. We had dinner at California Grill overlooking the MK fireworks. I called the cake hotline and the chef at CG never returned my call. I spoke to the front end of the restaurant and they suggested we just tell the hostess that we want a cake and they would thaw one out. Just what I wanted was a frozen cake to celebrate 25 years of being together! LOL. I guess I should have checked the frozen section at Publix to see if Pepperidge Farms made a 25 th anniversary cake. We are DVC members and I asked if they could help or make any suggestion. WDW was advertising away about the cake program and all they could provide was a frozen one at a restaurant that costs $125 per person. A DVC Castmember made it a point to call the chef directly and explain my frustration. He called back and the Chef,assured him they would make a “special dessert” for our celebration. DVC sent a Mickey gift basket with champagne and glasses to our room with A nice note was attached. We had a nice view of the MK from our table, as we ordered dinner I explained that DVC had spoken to the chef and they were going to make a special dessert for our celebration, we watched the fireworks. It was time for dessert and we had a lovely half frozen cake! I sent the cake back, paid our bill and left. It was nothing but sign of how bad things have gotten at WDW. I hope no one goes through our experience. It did not ruin our anniversary because a cake or dessert would never do that. What it did ruin was ruin my respect for Disney Management by allowing this type of experience to have occurred. BTW, I only began trying to accomplish this almost a month before our trip. It made us realize that Disney has stopped being a hospitality company and they are nothing but a marketing company. They make everything sound great and wonderful but they no longer produce the product they advertise. A lot of people criticized Eisner,however, his regime turned out quality products. I was disappointed to hear Iger staying longer. He has destroyed the whole vacation experience at WDW by running it like customer service at a cable company. I agree, I am trying to plan my son’s first birthday and have hit nothing but roadblocks with Disney, extremely annoying and upsetting to me. I called the boardwalk to see if they would make a toodles cake and was told NO and then hung up on. What about the ability for a custom cake? This cake would use the same mickey cake and just apply different frosting. We have 2 weeks to go until his birthday in Nov. Any suggestions? For my son’s 4th birthday, we plan on doing Disney cruise and then will frequent Hollywood Studios on his actual birthday. Is it feasible to have a really customized cake made at Boardwalk or other bakery and have delivered to the park/restaurant? I was trying to figure out how to get the cake we want but also visit Hollywood Studios in same day. Hi Phaedra! If you can pick it up from BoardWalk Bakery, they are able to do fancy customized cakes. Unfortunately, all the restaurants in DHS are served by the DHS bakery, which does not offer much in the way of customization. If you’re staying at a Disney resort, the best option would be to have the cake delivered to your room. Can you order specialty cupcakes? Hi Melanie! In the past cupcakes have not been an option, but definitely call the number for the Contemporary listed on the Cake Options By Location page to check, because stuff changes all the time. Private Dining can deliver whatever you end up ordering to your cruise, and they will include all the necessary serveware. No problem! I too was overjoyed to learn he’d returned. It’s hard to get a good-looking cake at WDW! 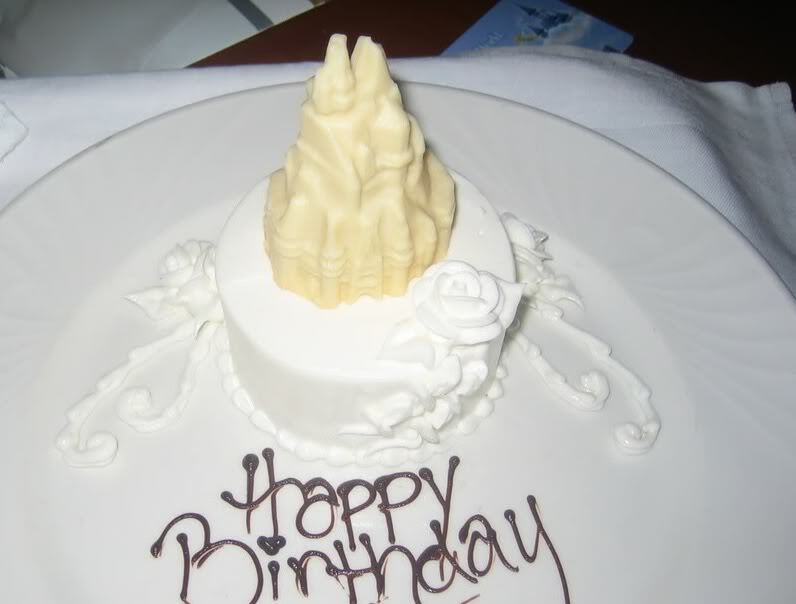 Which Resort has better tasting cakes in your opinion- Contemporary or Grand Floridian? I’ve worked with Chef Brian at Contemporary in the past, but he’s no longer there and I remember hearing both good & bad things about Contemp., if not using him… so I’m a little worried. We’re staying at Shades of Green, so we’d have to pick up the cake and ride the monorail with it to Poly, so it makes more sense for us to use Contemp vs GF, but GF gets better reviews. Your thoughts? Good news: Chef Brian is back at the Contemporary! All the resorts use the same recipes, so the cakes taste the same no matter where you get them. And the Contemporary charges at least 30% less for its cakes than the GF, plus it’s about 200% easier to work with them than the contact in Private Dining at the GF. So the Contemporary gets my vote! You might even see if they’d be willing to deliver to SOG for you, even though it’s not a Disney resort. Do they provide candles and sing at the Be Our Guest restaurant? All the Disney restaurants do, if you ask. My husband is a cast member and we would like to get a cake for a friend . would he be allowed to order and have it delivered to the resort where he works? I don’t see why not, as long as the friend was checked in at the time the cake was to be delivered. Also, if he wants to pay for it, he’d need to make sure they charged his card instead of the room. So I am planning to have a wedding in December of this year and was wondering if I would be able to order a cake from Disney? I saw one on their website and absolutely fell in love with it and wanted to know the quote for it. I won’t be having it at Disney World or on their property but it will be in Orlando. I do plan to stay at one of their resorts, though, during the weekend of my wedding. Who would I contact for further information. Thank you! Hi! It depends on which Disney resort you’re staying at. Check out my Cake Options By Location page to get the right phone number and see what your options are for the resort where you’re staying. We’re going to be at Disney for my daughters birthday and having dinner at Belles Castle. How do I go about ordering her a cake to have there after dinner? Thanks! Hi Karen! Here’s a link to the Magic Kingdom section of my Cake Ordering Options By Location page! The answer from the cake hotline about a Star Wars cake or Star Wars weekend type cake was a “no”. I find it weird that they can’t when they can make it in the park for the cupcakes and cakes at the Star Wars buffet. Maybe rules will change later. For today I chose a hitchiking ghosts theme. Oooh! That’s a great theme for a cake! Do you think they would make a Star Wars cake or is it also something they can’t make like Winnie the Pooh? They have made some Star Wars things in the past, but lately they have gotten stingier about which licensed properties they’ll let you have. On the other hand, it seems like not all cast members know these new rules, so depending on where you want the cake, you may have no problem getting one with Star Wars stuff on it! They are not serviced by Disney but do have their own pastry team. The phone number and options are listed toward the end of the Cake FAQ. This is a great article. I do want to mention that the bakeries will make rice crispy cakes as well. Most of my kids hate cake, but love rice crispies. For my son’s birthday we had a rice crispy cake (covered in frosting with a screen printing of WALLE on it) delivered to Chef Mickey’s, and this past November, for another child, I had a rice crispy cake with chocolate frosting, and chocolate aristocats on it. That was at Cape May Cafe. Yes, but they are very expensive—about $200 and up—and they feed about 40 people. Last year we had the Contemporary make us a sort of “maxi-mini cake” because the design we wanted was too big for a standard mini cake and we didn’t want a full 2-tier cake. It was a 3-inch atop a 5-inch and cost… $75 I think? With tax and private dining surcharge it was about $90. You can see it at the very bottom of this post. The Contemporary has been a bit stingy with the options since Chef Brian left the pastry team, but maybe if you tell them you saw this one and you loved it they’ll be willing to do something a bit more custom. Contact info is here. Thank you for the response. That’s a beautiful cake. I’m going to get in touch with them and see if they will do a similar size with my design ideas. Is it better to call or e-mail the Contemporary? Last year I had a cake made from them and I called but things seem to be different this year. Hmmm… Maybe try emailing, and then if you don’t hear back in about a week, call to follow up. Sometimes when you call you don’t get someone who is knowledgeable about the process. Thank you so much for the info Carrie!! Great idea, I’ll order a special one at Boardwalk Bakery and pick it up! Do you know if there are any options to order a cake or have one delivered to the Sparkling Dessert party in Epcot? Or can I buy one at one of the restaurants or Boardwalk Bakery and bring it into the party myself?> looking to surprise my boyfriend for his 30th next month, just booked the dessert party. I love that you want to bring a cake to a party that’s already full of desserts—a girl after my own heart! The easiest thing to do would be to order it for pickup at the BoardWalk Bakery and bring it with you. But be sure to also bring something to fend off all the other partygoers when they discover that you’re the only ones who got cake! Hi ! this is a great site! we would like to order a cake for our son’s third birthday celebration with Pooh at the Crystal Palace Restaurant. He has a peanut and tree nut allergy. It looks like most cakes are made in facilities that also process nuts. Any ideas of how to obtain a small cake that might be nut free? thanks so much! I think your best bet is to contact the Magic Kingdom Cake line and ask what your options are: 407-827-2253 or magickingdomcakes@disney.com. In the past they haven’t been able to guarantee that their allergen-free cakes were actually nut-free, but things change all the time. Hi Carrie! Thank you so much for all of this info. We are going to be at DW this summer during my daughter’s 5th bday. I’d love to have a Frozen themed cake. Maybe even a Barbie doll shaped cake (Elsa). Do you think they’d do that? We have breakfast reservations at Cinderella’s Royal Table & dinner at the Garden Grille in Epcot. Hi Ann! Cinderella’s Royal Table does offer a standard “Barbie Doll” style cake with several princess options, but so far I haven’t seen any Frozen options. I’d contact them using the info on this page and see if they’re planning to start offering one. Otherwise, they should be able to customize a more traditionally shaped cake with snowflakes and screen prints at either restaurant. Hi Mistie! This page lists the phone numbers to call for each park and resort: https://disneytravelbabble.com/how-to/order-cake/by-location/. Chef Mickey’s is at the Contemporary, so that’s the place you would call. Hello Carrie, thank you so much for the info. It definitely helps! Hi Carrie! I’m planning my Quince for 2014 and its Disney themed, do you happen to know any good bakeries in Massachusetts that could make a Cinderella’s Castle type cake really well? I want it to look authentic, and I can’t get an official Disney Cake. Hi! OK, I don’t know a whole lot about them, but several years ago I saved a magazine article with photos of amazing cakes from each state, and the bakery they featured in Massachusetts was Cakes to Remember in Brookline. Hope this helps! Hi Carrie, We are celebrating my son’s birthday at Disney in January but he doesn’t like cake. Do you know if ice cream cakes are available anywhere on property? Thanks! You know, anytime someone on the DIS has asked Disney about this, they’ve been told it’s not possible to get an ice cream cake. It never hurts to call Private Dining at the place where you’ll be staying or dining and see if the policy has changed, but I would bet it’s something to do with keeping it frozen and transporting it and blah blah blah they don’t want you to be disappointed…. Sorry I don’t have better news! How would one go about getting a Jack Jack (The incredibles) cake deliver to me for my sons first birthday. Disney doesn’t ship its cakes anywhere, but if you will be staying or dining at a Walt Disney World resort or theme park, you can call the corresponding phone number listed on the Cake Options By Location page. I want to order a cake that I can take to t-Rex for a family dinner, is this possible? We are staying at port orleans riverside from 9th October. Let’s see… I guess you could just order through Riverside to have it delivered to your room and then carry it there? I’d get on the phone to them ASAP—it can be hard to get a hold of someone at Port Orleans. I was wondering if you know how flexible the Disneyland Resort is in their cake requests? I’m hoping to see if they can do a 10th anniversary cake for us that’s a replica of our wedding cakes top tier. We’ve ordered cakes from WDW bakeries before and have found them to be more creative in their designs, so we’re not sure who to speak to or what to expect from requesting a cake at Disneyland. Thanks! The number to call is at the bottom of this page, but the options are generally pretty limited. 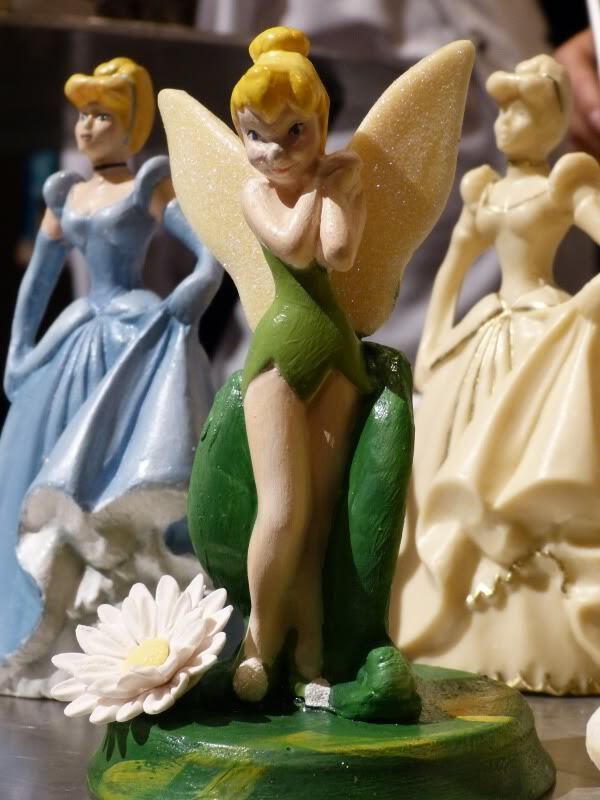 (Also, if you really love the taste of WDW’s buttercream, I should warn you that Disneyland uses a smoother, less-sweet Chantilly buttercream that is not my favorite.) That said, Disneyland does turn out some gorgeous wedding cakes, so the capability is there, but whenever I call, I can’t seem to get them to do more than a standard buttercream cake with frosted message. However, if you can get the CM on board with your idea and they’ll let you send in photos, maybe they’ll help you get something more elaborate. Definitely let me know how it goes! I called Disney Dining which is where you are to order cakes from and was rather disappointed by the information that I received. They do not do wedding cake recreations, even for only the top tier. Nor will they do anything creative that strays from their standard boxed cake of limited characters. Additionally when asked if they could email me a few pictures of what their cakes look like so that I would know what my options are, the person that I spoke to informed me that they don’t do that. I find this to be very frustrating as I am use to the creativity of WDW. I couldn’t help but get upset thinking about how frustrated that a simple cake request couldn’t even be accommodated. Having gotten married through DFTW @ DLR I know that they can make cakes, but the lack of access to having a nice cake made is beyond frustrating. Yeah, that’s about what I expected. However, you have an advantage—contact your DFTW planner and let her know what you’re trying to do. I’ll bet she can make it happen! Another thought… not being a fan of Disneyland’s cakes, I usually order mine elsewhere. For example, my all-time favorite bakery is Susiecakes, and their Newport Beach or Manhattan Beach locations could deliver to your hotel as long as you can be there to meet them. Animal Kingdom’s cakes are made by Hollywood Studios’ pastry team, which is very limited in what it can do. Last time I checked, things like, chocolate figures, mini cakes and fondant were not available. But it doesn’t hurt to call Tusker House and see (407-938-3243). Epcot recently got a real-live pastry chef, so maybe DHS has one now too. Hi! Am looking into a Memories wedding at the Polynesian. 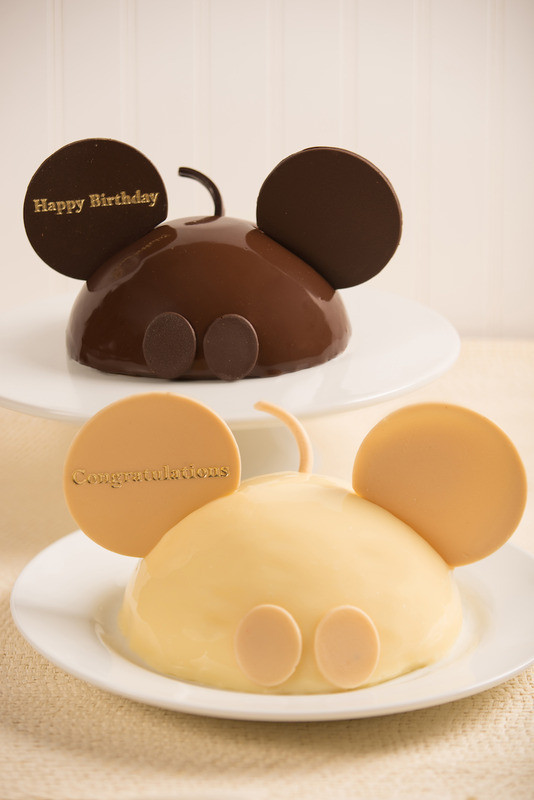 A cake is not included in the package but was wondering if we can get 6 mini wedding cakes in the Mickey design to go along with a meal at one of the restaurants later. If so, do you get choices in flavors? Thanks for any info! Yes, it just depends on where your meal is. For the Polynesian, those minicakes would be made by the Grand Floridian and cost $35+ (also, they feed two people each, if you’re looking to save a bit of money). The private dining contact at the GF with whom you would place your order is notoriously stingy about flavors, so you’d probably only be offered chocolate cake with chocolate filling or vanilla cake with vanilla filling. But sometimes you can get them to agree to more interesting flavors as long as you understand that they’re only available if the bakery happens to be making them for someone’s wedding cake that day. I’ve had good luck getting mini cakes in other flavors from the BoardWalk Bakery and the Contemporary. But you’d have to pick up at the former or be dining/staying at the latter. Can you order a cake for a guest’s room? I have friends staying at the GF in October for their anniversary. Can I order something to be delivered to their room? Yes, as long as they are checked in when you want to have it delivered. Also, usually it is charged to the guest’s room account, so you’d need to be sure that Private Dining understood they needed to charge your credit card for the cake (and then have your friends doublecheck their room bill just in case). Can I order a cake even if I am not getting married in disney? I would like to request a cake for my daughters 21st birthday in September. We will be dining at the Yachtsman steakhouse, will it be possible to have it delivered there? Also what kind of things can you request on the standard cake? Is it just a name? I would be interested in a white chocolate character, how much would this be for either 6/8 inch cake? There will be 6 of us but don’t want a big cake as past experience of too much cake can be overwhelming, so thinking of just going for 6inch. What are your thoughts? This page has the number to call to order a cake for the Yacht & Beach Club. They will probably tell you they can’t put a white chocolate figure on a 6-inch cake, but they could put it on the plate next to the cake. White chocolate character prices vary by resort, but Y&BC is on the high side—I’d figure on about $50. A 6-inch cake is plenty for 6 people. Designwise, you’d really need to talk to the pastry chef or at least the Private Dining contact to find out what’s possible. It helps if you can send in a photo of what you want. Hi Carrie! Heading to The Polynesian this weekend and wonder if I can pick up a ready made cake that’s not the “podium type”. Will GF or Contemporary have something done in their bakery/quick service area by chance? THANK YOU!!! Thank you so much for your quick reply! I will call and order then & hope to pick up at one of their spots. THANK YOU!!! Hi Sophia! I do not work for Disney so I cannot place a cake order for you. For the Crystal Palace you need to call the Cake Hotline at 407-827-2253 and follow the prompts for the Magic Kingdom to leave a message, and someone will call you back. You can also email them at magickingdomcakes@disney.com. Hope this helps! Hi Sophia! Which hotel or restaurant are you ordering the cake for? Let me know, and I can make usre you’re calling the correct number. 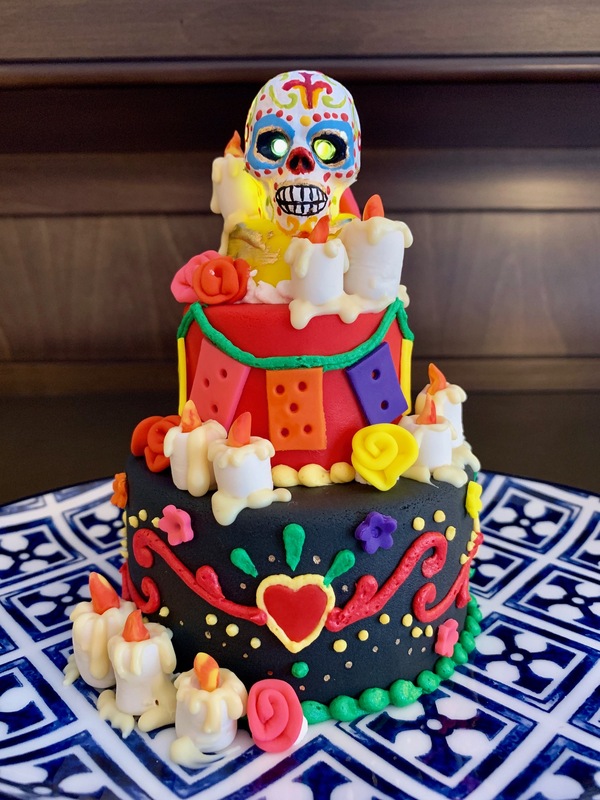 If the person you spoke to can give you an email address, you can send in a photo of your idea for the cake to show them exactly what you want. How do you order the flat screen character cake? Do you provide the image you want transfered to the cake, or do you ask what character you want and they pick the image? Thanks! You can do it either way. They should have a library of approved art to choose from, but if you have a specific image you want, ask for an email address to send it to. Hi! I was wondering if you have any information about getting one of the specialty cakes onboard a Disney Cruise? Yes! They don’t do custom work, but you can use this order form to select from a handful of options. Is there anyway I can have a cake made with fruit?? We will be celebrating her birthday while we are at Disney June 30 and she saw pictures online of a fruit cake and asked if she could have that. I was wondering if that was something you can do? Hi! I don’t work for Disney, I just aggregate all the info about ordering cakes there because they don’t. Fruit filling is definitely an option, and fruit topping, too, I’d imagine. I don’t know if they can make actual, Christmas-style fruitcake. Use the phone numbers on the Cake Options By Location page to contact the bakers at the place where you want the cake delivered—they’re the ones who can tell you exactly what’s available.